WARNING: Voltages in this equipment are hazardous to life. No user-serviceable parts inside. Refer all servicing to qualified service personnel. The safety certifications do not apply when the operating voltage is changed from the factory setting. Licensing: A ministerial license to operate this equipment may be required in certain areas. Consult your national authority for possible requirements. Changes or modifications not expressly approved by Shure Incorporated could void your authority to operate the equipment. Licensing of Shure wireless microphone equipment is the user’s responsibility, and licensability depends on the user’s classification and application, and on the selected frequency. Shure strongly urges the user to contact the appropriate telecommunications authority concerning proper licensing, and before choosing and ordering frequencies. This device complies with Industry Canada licence-exempt RSS standard(s). Operation of this device is subject to the following two conditions: (1) this device may not cause interference, and (2) this device must accept any interference, including interference that may cause undesired operation of the device. Note: EMC conformance testing is based on the use of supplied and recommended cable types. The use of other cable types may degrade EMC performance. WARNING: Danger of explosion if incorrect battery replaced. Operate only with AA batteries. Note: Use only with the included power supply or a Shure-approved equivalent. Battery packs may explode or release toxic materials. Risk of fire or burns. Do not open, crush, modify, disassemble, heat above 140°F (60°C), or incinerate. WARNING: Danger of explosion if battery incorrectly replaced. Replace only with same or equivalent type. Dispose of battery packs properly. Check with local vendor for proper disposal of used battery packs. This device operates under an ACMA class licence and must comply with all the conditions of that licence including operating frequencies. Before 31 December 2014, this device will comply if it is operated in the 520-820 MHz frequency band. WARNING: After 31 December 2014, in order to comply, this device must not be operated in the 694-820 MHz band. Caution: Avoid operating mobile phones and mobile broadband devices near your wireless system to prevent the possibility of interference. QLX-D® Digital Wireless delivers defined, streamlined performance with transparent 24-bit digital audio. Combining professional features with simplified setup and operation, QLX-D offers outstanding wireless functionality for demanding live sound events and installations. Shure digital wireless technology enables QLX-D to transmit clearly detailed audio with extended, virtually flat frequency response. Designed to be highly RF spectrum efficient, QLX-D can operate more than 60 compatible channels simultaneously in a single frequency band. Automatic channel scan and IR sync make finding and assigning an open frequency quick and easy. Ethernet connection provides networked channel scanning across multiple receivers and Shure Wireless Workbench® control software compatibility for advanced frequency coordination. AES-256 encryption comes standard and can be easily enabled for secure wireless transmission. QLX-D also adds Shure rechargeable power options to provide dramatic long-term cost savings and extended transmitter battery life over alkaline batteries, and battery metering that reports remaining runtime in hours and minutes. With clearly defined performance and innovation, QLX-D delivers the very latest in digital wireless technology from Shure. Model variations with additional components are available to meet specific performance situations. ① Connect an antenna to each of the antenna connectors. ② Connect the power supply to the receiver and plug into an AC power source. ③ Connect the receiver audio output to a mixer or amplifier. ④ Press and hold the power button to turn on the receiver. Press the menu button on the receiver to access the scan function. Press the enter button to start a frequency scan. The scan icon will flash while in scan mode. When the scan is complete, the selected channel appears on the display. ① Accessing the Battery Compartment Press the side tabs on the bodypack or unscrew the cover on the handheld as shown to access the battery compartment. Note: If using AA batteries, select a battery type from the transmitter menu to ensure accurate battery metering. Press the sync button on the receiver. The red ir LED will blink indicating that sync mode is active. Align the IR sync windows of the transmitter and receiver at a distance of <15 cm (6 in.). 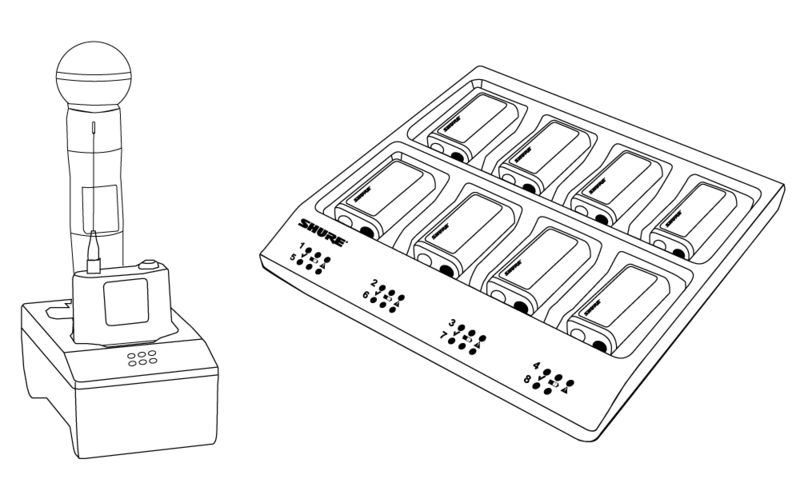 When the transmitter and receiver are aligned, the red ir LED remains on and the sync will automatically occur. sync good appears on the display when IR sync is complete. The blue rf LED will illuminate indicating that the transmitter is within range of the receiver. Note: If the IR sync fails, repeat the IR sync procedure, carefully maintaining alignment between the IR windows of the transmitter and receiver. Test the transmitter at performance levels while monitoring the audio meter and the audio LED. The audio meter should display at least 3 bars and the audio LED should be green. Reduce the gain if there is audible distortion of the audio. Increase or decrease the gain if necessary by pressing the arrow buttons on the receiver front panel. Clip the transmitter to a belt or slide a guitar strap through the transmitter clip as shown. For best results, the belt should be pressed against the base of the clip. ① Display Shows menu options, receiver and transmitter settings. ② Arrow Buttons Adjust gain setting or change menu parameters. ③ Enter Button Press to save menu or parameter changes. ④ Sync Button Press to activate IR sync. ⑤ Power Switch Powers receiver on or off. ⑧ RF LED Illuminates when RF link with transmitter is active. ⑨ IR Window Align with the transmitter IR window during an IR sync to automatically program transmitters. ⑪ Power Cord Strain Relief Secures power cord. ⑫ Power Supply Jack Connection point for DC power supply. ⑬ Ethernet Port For network connection. ⑭ Receiver Reset Press to restore receiver default settings. ⑯ Mic/Line Switch Sets output level to microphone or line. ① Channel Displays channel setting. ② Active Antenna Indicator Illuminates to indicate which antenna is active. ③ RF Signal Meter Number of bars displayed corresponds to RF signal level - OL = overload. ④ Audio Meter Number of bars displayed corresponds to audio level. TxOL = Illuminates when transmitter input is overloaded. Reduce input from microphone or instrument to prevent clipping. ⑤ Gain Level Displays receiver gain setting in 1 dB increments. ⑦ Frequency Setting Selected frequency (MHz). ⑧ Encryption Status Illuminates when encryption is enabled. ⑨ Scan Displayed when scan function is active. ⑩ Network Scan Displayed when network scan function is active in multi-receiver systems. 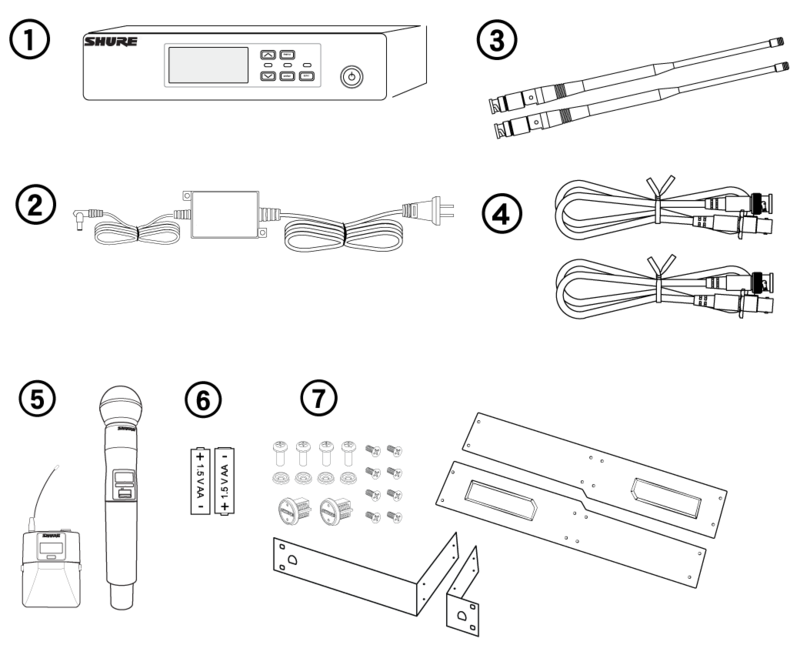 ⑪ Network Connection Indicator Illuminates when additional Shure components are detected on the network. ⑫ TV Channel Displays the number of the TV channel containing the selected frequency. ⑬ Transmitter Battery Icon Indicates remaining battery life. Enable the Low Battery Alert to flash the receiver display when battery runtime is less than 30 minutes. ⑭ SB900 Battery Runtime When the transmitter is powered by a Shure SB900 rechargeable battery, remaining runtime is displayed in hours:minutes. The receiver has a main menu for setup and configuration and an advanced menu to access additional receiver functions. Starting from the main menu home screen, press menu while holding the enter button to access the advanced menu. Each additional press of the menu button advances to the next menu screen in the following order. ⑤ Firmware Update Displays what kind transmitter firmware the receiver has available. See Firmware Updates for more details. For application and configuration details, see the related guide topic for each advanced feature. To return to the home screen from any menu without saving changes, press and hold the menu button. Powers the transmitter on or off. View menu screens and settings. Press any control button to activate the backlight. Align with the receiver IR window during an IR sync for automated transmitter programming. menu = Use to navigate between menu screens. ▼▲ = Use to select menu screens, edit menu parameters, or choose a home screen display option. enter = Press to confirm and save parameter changes. Tip: Press the menu button to exit without saving parameter changes. Requires 2 AA batteries or a Shure SB900 rechargeable battery. Secures batteries when powering transmitter with AA batteries instead of Shure SB900 battery. See Optional Accessories for a list of compatible cartridges. Connects to a 4-Pin Mini Connector (TA4F) microphone or instrument cable. Align the cover as shown to prevent reflections from the battery contacts during broadcasts or performances. ① Battery Indicator Bars displayed indicate remaining battery life. ③ Encryption Status Icon displayed when encryption is enabled. 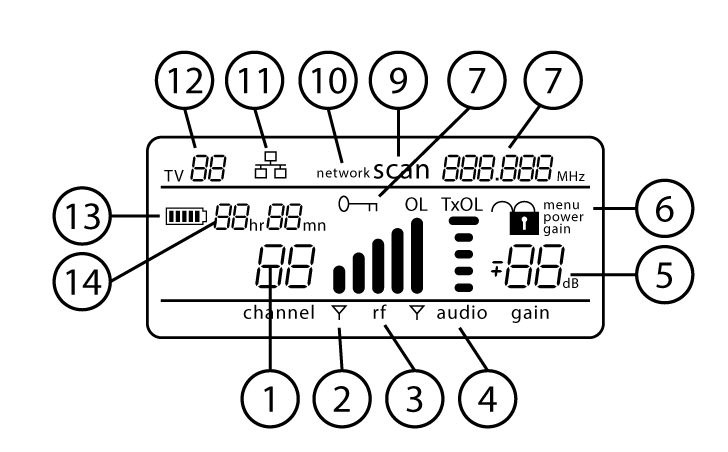 ④ Lock Displayed when transmitter controls are locked. ⑤ RF Power RF power setting (Lo or Hi). ⑥ Mic Offset Displays mic offset level in 3 dB increments. The transmitter features individual menu screens for setting up and adjusting the transmitter. To access the menu options from the home screen, press the menu button. Each additional press of the menu button advances to the next menu screen. ② channel Use the arrow buttons to scroll through the channels. ③ frequency Use the arrow buttons to adjust the frequency. Press and hold for faster scrolling. ⑥ mic offset dB Use to match audio levels between two transmitters used in a combo system. Range is 0 to 21 dB (3 dB increments). Adjustments occur in realtime. ⑦ battery type Use to set the battery type to match the installed AA battery type to ensure accurate battery metering. Menu is not displayed when Shure SB900 batteries are installed. To access the menu options from the home screen, press the menu button. Each additional press of the menu button advances to the next menu screen. Control lock options are available for both the receiver and the transmitter to protect against accidental or unauthorized changes. Locks can be directly set from the component menu, or remotely set from WWB6. To maintain protection, controls remain locked when the transmitter is turned off and turned on. Press the menu button to navigate to the lock settings. Use the arrow buttons to add or remove the lock options shown next to the lock icon. Press enter to save the lock settings. Tip: To unlock the menu and clear all locks, press and hold the menu button while in the home screen until the unlock icon appears. Press enter to confirm and save change. To unlock gain or power settings, navigate to the lock settings by pressing the menu button. Press the arrow buttons to de-select a lock option. Press enter to confirm and save change. 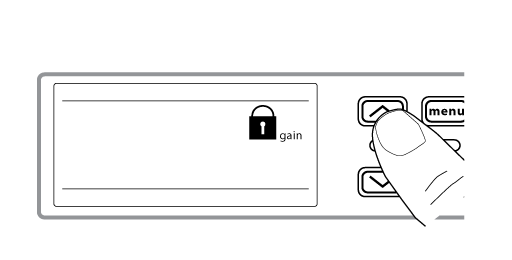 The transmitter controls can be locked or unlocked by selecting On (locked) or OFF (unlocked) from the transmitter lock menu. 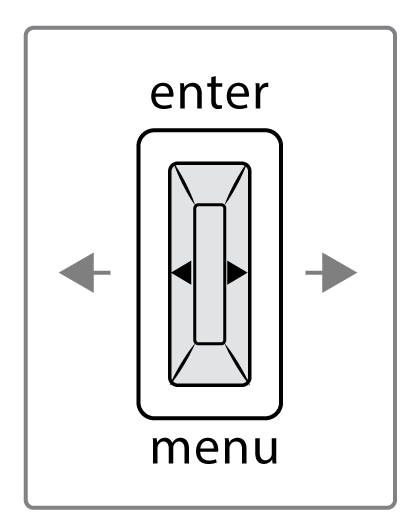 If an attempt is made to access a locked control, the lock icon will flash, indicating that the transmitter controls are locked. Use the arrow buttons to select on. Press enter to save. The lock icon appears on the display to confirm that the control locks are enabled. Press and hold the menu button until OFF and the unlock icon appear on the display. Press enter to save changes. Note: If using AA batteries, set the battery type using the transmitter menu. To ensure accurate display of transmitter runtime, set the battery type in the transmitter menu to match the installed AA battery type. 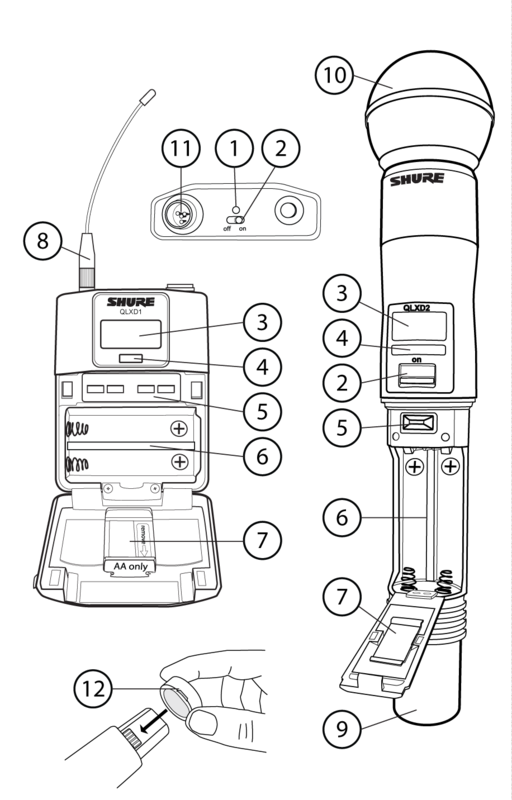 If a Shure SB900 rechargeable battery is installed, selecting a battery type is not necessary and the battery type menu will not be displayed. Press the menu button to navigate to the battery icon. 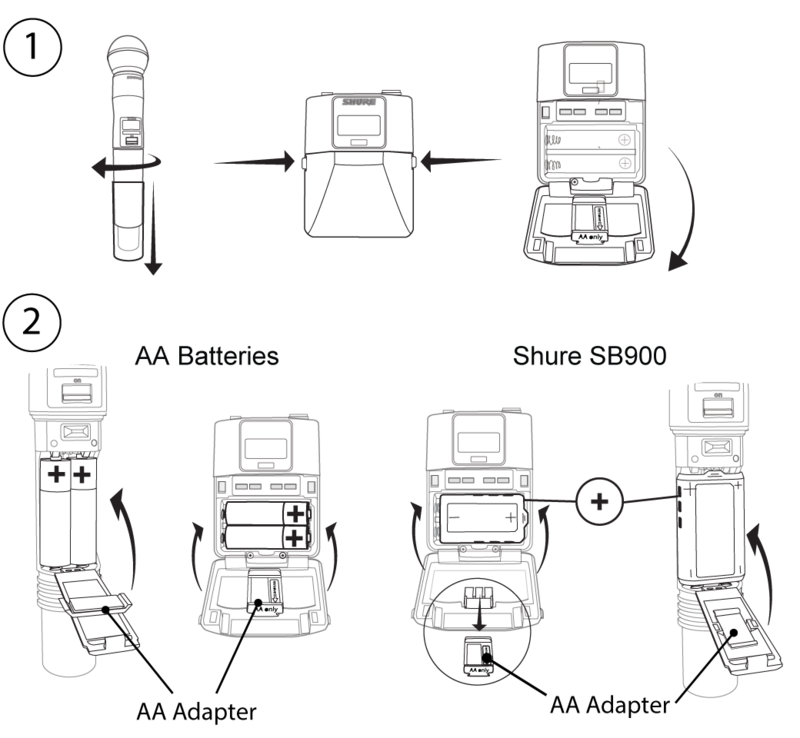 Shure SB900 lithium-ion batteries offer a rechargeable option for powering the QLX-D transmitters. Batteries quickly charge to 50% capacity in one hour and reach full charge within three hours. Single chargers and multiple bay chargers are available to recharge the Shure batteries. Caution: Only charge Shure rechargeable batteries with a Shure battery charger. The single bay charger offers a compact charging solution. Plug the charger into an AC power source or USB port. Insert a battery into the charging bay. Monitor the charging status LEDs until charging is complete. 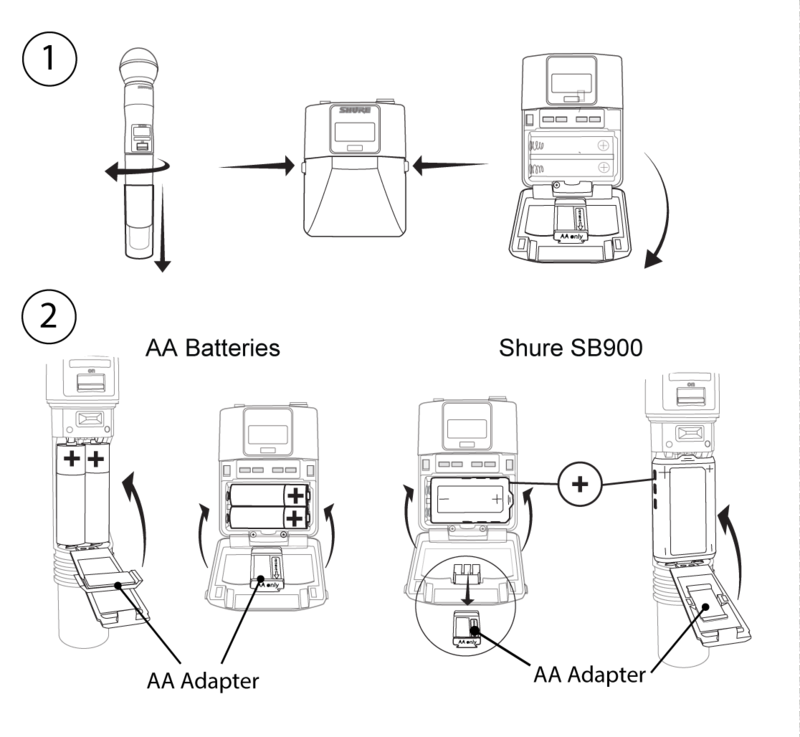 Multiple bay chargers can charge individual batteries or batteries installed in transmitters. Plug the charger into an AC power source. Insert batteries or transmitters into the charging bay. Proper care and storage of Shure batteries results in reliable performance and ensures a long lifetime. Fully insert the batteries as shown to ensure proper battery contact and to allow the door to latch securely. The receiver display can be configured to flash when the battery runtime for a transmitter is less than 30 minutes. Press menu while holding the enter button to access the advanced menu. Use the arrow buttons to navigate to the Alert screen. Select On or Off to enable or disable the alert function. Press the enter button to save. The gain control sets the overall signal level for the system. The default gain level is 12 dB and the available gain range is -18 to 42 dB, in 1 dB increments. Set the gain to a level where the audio LED appears green or yellow, with only the highest audio peaks causing the LED to occasionally turn red and engage the limiter. Reduce the gain if there is audible distortion of the audio. Test the transmitter at performance levels when adjusting the gain. Monitor the audio meter and the audio LED to prevent overloads. The QLX-D receiver features Advanced Encryption Standard (AES-256) to protect the audio signal. 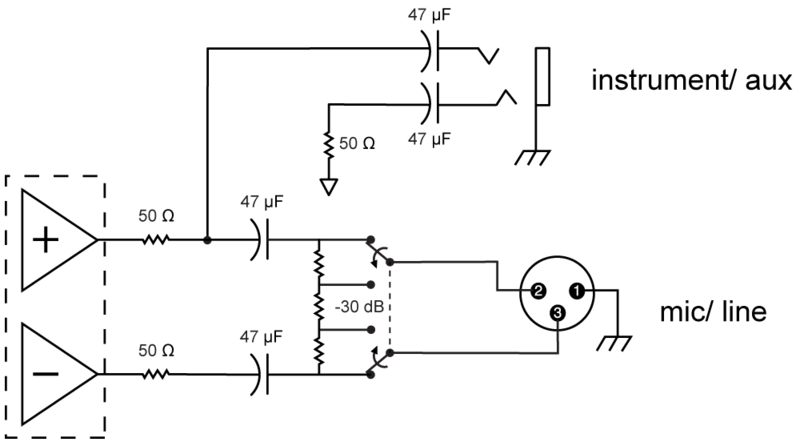 When encryption is enabled, the receiver generates a unique encryption key which is shared with a the transmitter during an IR sync. Transmitters and receivers that share an encryption key form a protected audio path, preventing unauthorized access by other receivers. To maintain security, components remain encrypted when turned off and on. Press the menu button to navigate to the encryption menu, indicated by the key icon. Press enter to save. The key icon will be shown on the receiver display. Press the sync button and align the IR sync windows of the transmitter and receiver. The encryption key icon will appear on the transmitter screen when the IR sync is complete and the encryption key has been transferred from the receiver. Additional transmitters can share the same encryption key with a single receiver. Perform an IR sync to encrypt each additional transmitter. Note: When OFF is selected to disable encryption, perform an IR sync to clear the encryption key from the transmitter and prevent an encryption mismatch error or FAIL message. Press the menu button to navigate to the encryption menu. IR sync the transmitter and receiver to clear the encryption key from the transmitter and prevent an encryption key mismatch between components, indicated by a FAIL message. Note: If encryption has been set from off to on, the receiver will generate a new encryption key and must be IR synced to the transmitter to share the new key. A wireless audio channel is formed when a receiver and transmitter are tuned to the same frequency. To ease setup, frequencies available to the QLX-D system are organized into channels. Each channel is assigned to a specific preset frequency. Turn off: All transmitters for system you are setting up to prevent interference with frequency scans. Turn on: The following potential sources of interference including other wireless systems, computers, CD players, large LED panels, and effects processors to prevent selection of occupied frequencies. The simplest way to create an audio channel is to use the scan function to find the best available receiver channel, and then use the IR sync feature to automatically tune the transmitter to the receiver channel. The Scan function automatically selects the best available receiver channel. Navigate to the Scan menu option. Press enter to start the scan. When the scan is complete, the channel will appear on the display. The Network Scan feature automates frequency assignment by using a single receiver to scan and deploy frequencies to all networked receiver within the same frequency band. Connect receivers to an active Ethernet network. All receivers must be on the same subnet. Prior to performing a network scan, turn on all receivers and allow 60 seconds for all receivers to join the network. Choose a group or custom group for deployment on the receiver that will be used to initiate the network scan. To start a network scan, press the menu button and navigate to the network scan menu. Press enter. When the scan is complete, the displays of receivers waiting for frequencies will flash. Press enter to deploy the frequencies or press menu to cancel the deployment. The front panel LEDs on each receiver will blink when a deployed frequency has been assigned. Note: Full frequency deployment may not occur if the number of receivers in the network exceeds the number of available frequencies in the selected group. Try another group or rescan after turning off unused receivers. Performing an IR Sync automatically tunes the transmitter to match the receiver frequency, forming a wireless audio channel. An audio channel can be manually created by simply setting the receiver and transmitter to the same channel number. 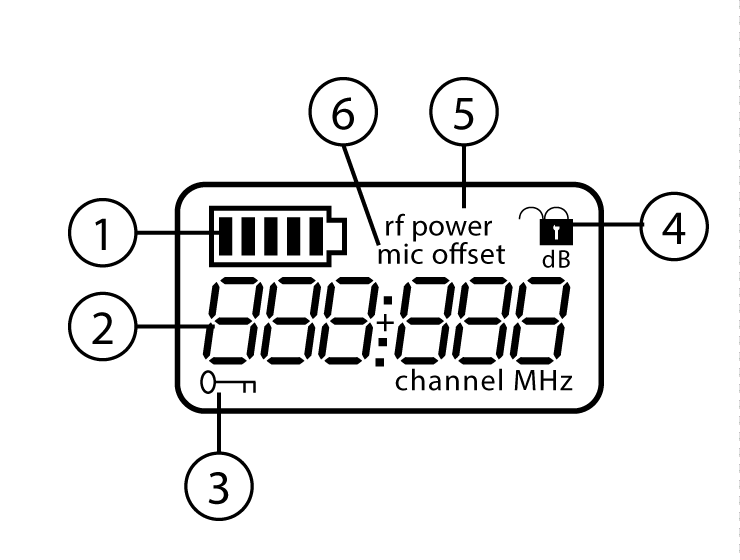 For example, a receiver set channel 3 and a transmitter channel 3 would form an audio channel. Use manual channel configuration to assign specific channels to receivers and transmitters as an alternative method to automatically creating channels with IR sync. Navigate to the channel setting. Use the arrow buttons to scroll through the channels. Press enter to select a channel and save. Manual frequency selection can be used instead of channels to set the transmitter and receiver to a specific frequency. For example, an audio channel can be created by setting the receiver and transmitter to same frequency. Press menu to navigate to the frequency setting option. Use the arrow buttons to adjust the frequency. Press and hold for faster scrolling. Linking two transmitters to a receiver offers the flexibility to provide a performer with either a handheld or bodypack transmitter to meet their preference. For performances requiring instrument changes, two bodypack transmitters can be linked to a single receiver. Note: Only turn on and operate one transmitter at a time to prevent interference between the transmitters. Both transmitters must be individually linked to the receiver by performing an IR Sync. Turn on the first transmitter and perform an IR Sync with the receiver. Perform a sound check and adjust the transmitter gain if necessary. When finished, turn off the transmitter. Turn on the second transmitter and perform an IR Sync with the receiver. Test the transmitter at performance conditions and adjust the transmitter gain if necessary. When finished, turn off the transmitter. 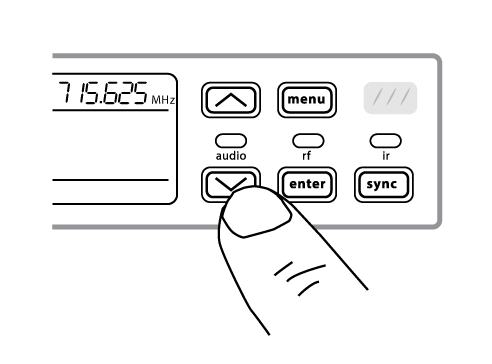 When linking two transmitters to a receiver, there may be a difference in volume levels between microphones or instruments. If this occurs, use the Mic Offset function to match the audio levels and eliminate audible volume differences between transmitters. If using a single transmitter, set Mic Offset to 0 dB. Turn on the first transmitter and perform a sound check to test the audio level. Turn off the transmitter when finished. 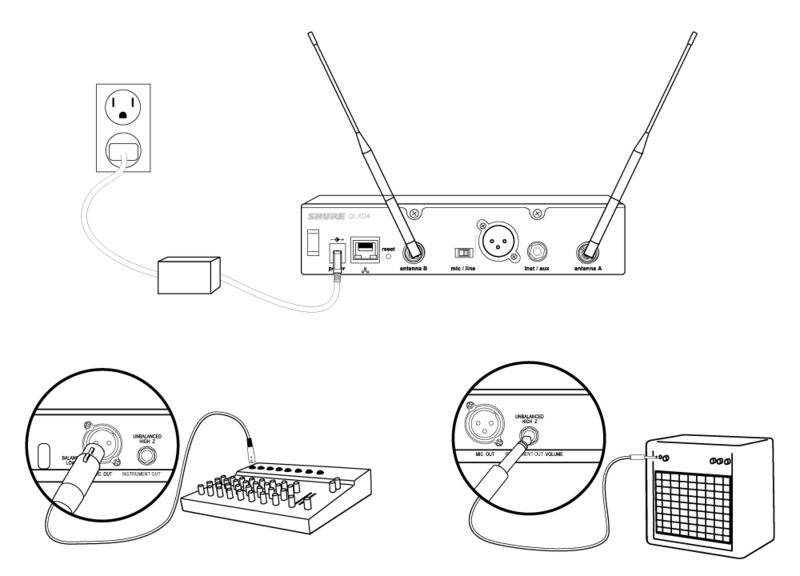 Turn on the second transmitter and perform a sound check to test the audio level. If there is an audible difference in the sound level between the transmitters, navigate to the Mic Offset menu on the transmitter to increase or decrease the Mic Offset in realtime to match the audio levels. The transmitter offers two RF power settings which determine the transmitter range. Use the Lo setting when the transmitter and receiver are in close proximity. Navigate to the transmitter rf power menu. Use the arrow buttons to select Hi or Lo. QLX-D receivers are compatible with the Axient AXT600 Spectrum Manager. Networked receivers will appear in the device inventory and frequencies from the Compatible Frequency List can be deployed and monitored by the Spectrum Manager. For more information regarding the Spectrum Manager, see the Axient System Guide. Transmitters and receivers from QLX-D and ULX-D component groups can be paired to form audio channels. Manually tune the receiver and transmitter to the same frequency. IR sync between QLX-D and ULX-D components is not supported. To create an audio channel, manually set the receiver frequency to match the frequency of the transmitter. If using ULXD6 or ULXD8 transmitters with a QLX-D receiver, you can only make changes to transmitter presets using Wireless Workbench. Open receiver properties in WWB. Make changes to transmitter presets and click Apply. The new settings will be sent to the QLX-D receiver. On the receiver front panel, hold enter while pressing menu to enter the advanced menu. Press menu to advance to Preset bn gn. The IR window will flash. Align the transmitter IR window with the receiver to send the presets to the transmitter. The parameter for TV channel spacing allows the receiver to match regional TV bandwidth usage and accurately display local TV channels. Press and hold the enter button, and then press the menu button to access the advanced features menu. Press the menu button to navigate to the TVCH menu. Use the arrow buttons to select the channel bandwidth that corresponds to the local region. Specific channels and frequencies can be selected and placed into custom groups. Custom groups are commonly used to assign networked receivers to a specific range of frequencies or to pre-configure receivers for rental applications. Once a custom group has been created, it can be loaded to the receiver using the group menu. When network scan is used to assign frequencies from a receiver with a custom group selected, all of custom groups (U1, U2, U3, etc...) from that receiver will be loaded to all other receivers on the network. Selecting A Custom Group The receiver has 6 custom groups available named U1, U2, U3, U4, U5, and U6. Press menu while holding the enter button to access the Custom Group screen. Press enter to enable editing of a group (indicated by the group flashing). User the arrow buttons to select a group (U1 to U6). Press enter to advance to channel selection. Use the arrow buttons to select a channel (1-60). Each group can contain up to 60 channels (frequencies). Press enter to save the selected channel and advance to frequency assignment. Use the arrow buttons to assign a frequency to the selected channel. After pressing enter, the channel will flash to allow for adding more channels and frequencies to the custom group. To add more channels and frequencies, repeat steps 2 and 3. When finished, press the menu button several times to return to the main menu. Turn on the transmitter and press the sync button on the receiver. Align the IR sync windows of the transmitter and receiver. sync good appears on the display when IR sync is complete. User the arrow buttons to navigate to display the group number and the words DEL. Press enter to delete the group. Enter the custom groups menu and select the frequency for the channel to be deleted. Press and hold an arrow button until the frequency displays ---.--- MHz. Press and hold the menu button to confirm change and exit. Custom groups can be created in WWB6 by accessing the Frequency Coordination tab. Refer to the WWB6 help system for detailed instructions for configuring Custom Groups. The receiver uses an Ethernet connection to network with other components and includes an internal DHCP client for automatic network configuration when connected to a DHCP enabled router. Insert an Ethernet cable in the Ethernet port on the rear of the receiver. Connect the cable to a computer or router. The port LEDs on the receiver will illuminate to indicate network connectivity and network traffic. Enable a DHCP service on the server or use a DHCP enabled router. When the receiver is powered on, the DHCP server will automatically assign an IP address to the receiver. Tip: Use the network reset option available in the advanced features menu to return the receiver to the default DHCP addressing mode. If the icon is not illuminated, check the cable connection and the LEDs on the Ethernet port. If the Ethernet port LEDs are not illuminated and the cable is plugged in, replace the cable and recheck the LEDs and network icon. Start WWB6 software and use Inventory view to see devices connected to the network. If not, find the IP address from one of the devices on the network (such as a receiver) and see if you can ping it from the computer running WWB6. From a WINDOWS/MAC command prompt, type ‘ping IPADDRESS’ of the device (e.g. "ping 192.168.1.100"). 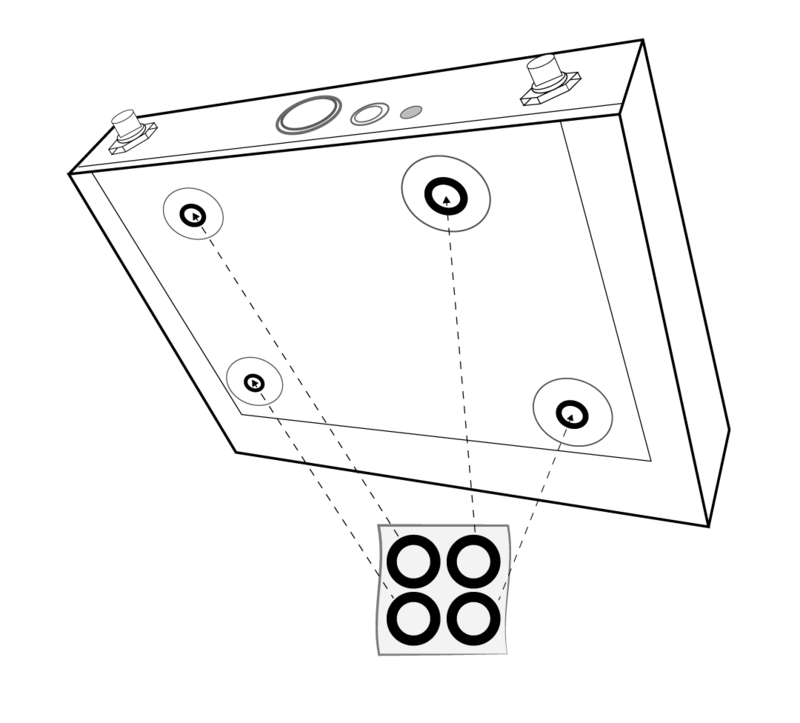 If the ping returns success (no packet loss), then the computer can communicate with the device on the network. If the ping returns failure (100% packet loss), then verify that the IP address of the computer is on the same subnet as the receiver. If the pings are successful and the devices still do not show up in the WWB6 inventory, check to ensure all firewalls are either disabled or allow the WWB network traffic to pass to the application. Check that firewall settings are not blocking network access. IP addresses and subnet masks can be manually set from the advanced menu in the receiver or from the monitor panel in Wireless Workbench 6. Network settings entered manually must be valid and conform to IP protocols to ensure proper network communication. IP addresses and subnet addresses contain 4 groups of numbers. Each group can contain up to 3 digits. A decimal point separates each group. Press the menu button to navigate to the IP menu. Use the arrow buttons to set the mode to St (static) and press enter. Use the arrow buttons to edit the first group. Press enter to save and continue to the next group. Use the arrow buttons and enter button to edit the remaining 3 groups. When group 4 has been edited, the display will show the subnet mask menu. Use the arrow buttons to scroll and select a preset value for each of the subnet mask groups. When finished, press enter to save settings. Note: To restore automatic DHCP IP addressing, enter the IP menu and select AU (automatic). The Network Reset menu option can also be used to restore DHCP addressing. Open the Channel Properties tab in WWB6. Click on Utilities and set the networking mode to Manual. Enter valid numbers in the IP and Subnet fields. The receiver connects to external controls systems (AMX or Crestron) via Ethernet cables. Shure's Wireless Workbench 6 (WWB6) software enables networked monitoring and control of the QLX-D receiver. Additional tools in WWB6 offer RF spectrum monitoring, network configuration, and firmware updating. Visit www.shure.com/wwb for a free download of Wireless Workbench software. Manage and monitor receiver settings by opening the Monitor tab in Wireless Workbench. Click on the Settings button to show or hide the full Properties window. Click on the Inventory tab to view the receiver channels. Double-click on parameters to enable editing. Tip: Clicking on the receiver icon next to the channel name flashes the front panel LEDs on the receiver for remote identification. When Hardware Identify is triggered from a receiver, the corresponding representation of that receiver is flashed in the WWB inventory display, allowing for remote identification. Hardware Identify can be triggered from the receiver by pressing and holding the enter button for at least 3 seconds. Click the Dismiss button on the WWB Inventory screen to exit the function. Firmware is embedded software in each component that controls functionality. Periodically, new versions of firmware are developed to incorporate additional features and enhancements. When updating receiver firmware, update transmitters to the same firmware version to ensure consistent operation. The firmware version is numbered in the form of MAJOR.MINOR.PATCH (e.g., 1.2.14). At a minimum, all devices on the network (including transmitters), must have the same MAJOR and MINOR firmware version numbers (e.g., 1.2.x). 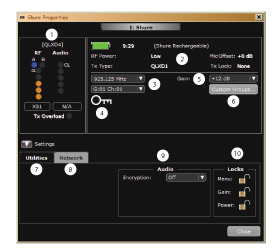 A free Shure Update Utility tool is available by visiting www.shure.com. The Shure Update Utility is also bundled with Shure Wireless Workbench software. 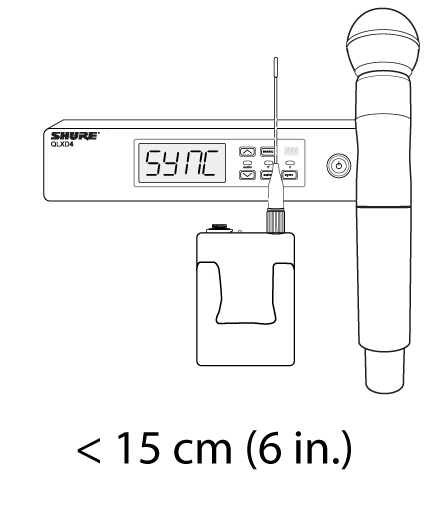 Refer to the help instructions to use the Shure Update Utility. CAUTION! Ensure that receiver power and network connections are maintained during a firmware update. Do not turn off the receiver until the update is complete. Connect the receiver and computer to the same network. Open the Shure Update Utility. Click on the firmware tab to find available updates. Use the Import button if manually importing firmware files. Click the Update Device tab and check the Version to install box next to each device. Click Send Updates to load the firmware to the networked devices. When the download is complete, the receiver will reboot with the updated firmware installed. To update transmitters, download firmware to the receiver. You can download firmware for handheld and bodypack transmitters, or for boundary and gooseneck transmitters. The receiver sends firmware to the transmitter using the IR Sync window. Press menu while holding the enter button to access the advanced menu. Use the menu button to navigate to the update menu. 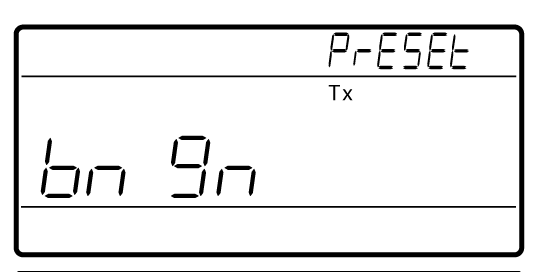 The receiver displays the type of transmitter firmware it has available. The receiver holds one type of firmware at a time. Press enter to start the update. When the red IR LED flashes, align the receiver and transmitter IR sync ports. The red LED will remain illuminated to indicate correct alignment and the download will automatically start. Maintain alignment during the update and monitor download progress (0 to 100%) on the receiver screen. When the update is complete, "TX Update good" is shown on the receiver display. If the screen shows Err. 09, update again with a transmitter type that matches the firmware held by the receiver. Make sure that the receiver and transmitter are receiving sufficient voltage. Check the battery indicators. Replace or recharge the batteries if necessary. Adjust the system gain on the front of the receiver. Ensure the mic/line switch setting (XLR output only) on the back of the receiver corresponds to the input of the mixing console, amplifier, or processor. Check that all cables and connectors are fully engaged or locked into position. Inspect cables for damage. Replace if necessary. The transmitter and the receiver can be locked to prevent accidental or unauthorized changes. If a locked control is accessed, the lock icon on the display will flash. Follow the instructions to unlock the receiver or transmitter. Paired transmitters and receivers must have the same firmware version installed to ensure consistent operation. See Firmware Updates topic for firmware update procedure. Indicates an encryption key mismatch has been detected. Perform an IR sync between the receiver and transmitter to clear the error. When using Custom Groups, always perform an IR sync from the Custom Groups menu in the receiver to ensure accurate display of group and channel information. See Custom Groups topic for additional details. The blue RF LED will illuminate when a linked transmitter is within range of the receiver. Measure the transmitter range before a performance to avoid operating beyond the specified transmitter range. The RF meter bars indicate amount of RF power being received. This signal could be from the transmitter, or it could be from an interfering source, such as a television broadcast. If the meter shows a signal level when the transmitter is off, then that channel may have interference. Check the surrounding area for sources of interference or change the receiver to a clear frequency. A red RF LED indicates RF overload. Avoid operating multiple systems in close proximity. Look at the label on the transmitter and receiver to make sure they are in the same band (G50, J50, L50, etc...). Perform a scan to find the best open frequency. Perform an IR sync to transfer the settings to the transmitter. For multiple systems, make sure that each receiver is assigned to a unique channel. 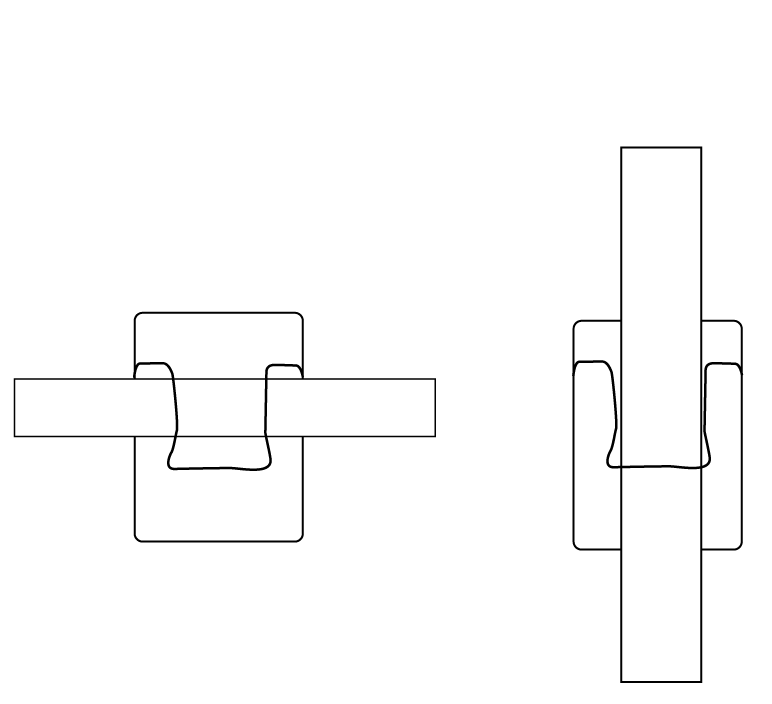 Interference will occur if two transmitters are set to the same channel. Maintain a line of sight between transmitter and receiver antennas. 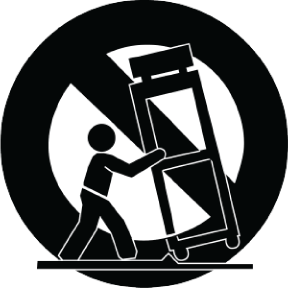 Move receiver antennas away from metal objects or other sources of RF interference (such as CD players, computers, digital effects, network switches, network cables and Personal Stereo Monitor (PSM) wireless systems). Eliminate RF overload (see below). If you are using active antennas, reduce antenna or amplifier gain. Error codes are generated when the receiver detects a condition that can potentially affect system performance. If an error is displayed on the receiver, use the following table to identify the problem and find the corresponding solution. Err.001 Audio Compatibility Update transmitter and receiver firmware to the latest version. Err.002 Encryption Mismatch between Shure product lines Set encryption to off for components from different Shure products lines, such as QLX-D and ULX-D.
Err.003 Encryption Mode Mismatch Perform an IR sync between the transmitter and receiver to clear the error. Err.004 Band Mismatch Receiver and transmitter are operating in overlapping frequencies from different bands. Err.005 Frequency Mismatch Receiver and transmitter are from bands that do not share compatible frequencies. Err.006 No Frequencies Found Rescan or use WWB to find a frequency. Err.007 Firmware Mismatch Update firmware on the transmitter and receiver. Err.008 Shure SB900 battery runtime does not appear on display Check that battery is firmly installed into the battery compartment. If condition persists, replace the battery. Err.009 Transmitter Type Mismatch To complete the firmware update, match the type of transmitter to the type of firmware the receiver currently has. Antenna Distribution System UA845 E "B"
Certified under FCC Part 74. Certified by IC in Canada under RSS-102 and RSS-210. IC: 616A-QLXD1G50, 616A-QLXD1H50, 616A-QLXD1J50, 616A-QLXD1L50, 616A-QLXD2G50, 616A-QLXD2H50, 616A-QLXD2J50, 616A-QLXD2L50. FCC: DD4QLXD1G50, DD4QLXD1H50, DD4QLXD1J50, DD4QLXD1L50, DD4QLXD2G50, DD4QLXD2H50, DD4QLXD2J50, DD4QLXD2L50. Note: For transmitters operating in the V50 and V51 bands: nominal free space antenna gain at middle of the band is typically -6 dBi, and rolls off at the band edges an additional -4 dB. Approved under the Declaration of Conformity (DoC) provision of FCC Part 15. Conforms to electrical safety requirements based on IEC 60065. Note: Actual range depends on RF signal absorption, reflection and interference. 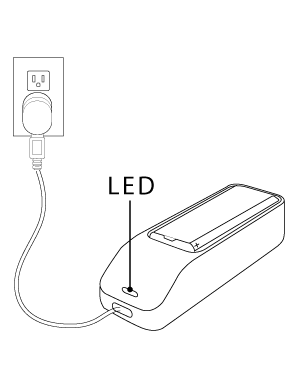 Positive pressure on microphone diaphragm produces positive voltage on pin 2 (with respect to pin 3 of XLR output) and the tip of the 6.35 mm (1/4-inch) output. 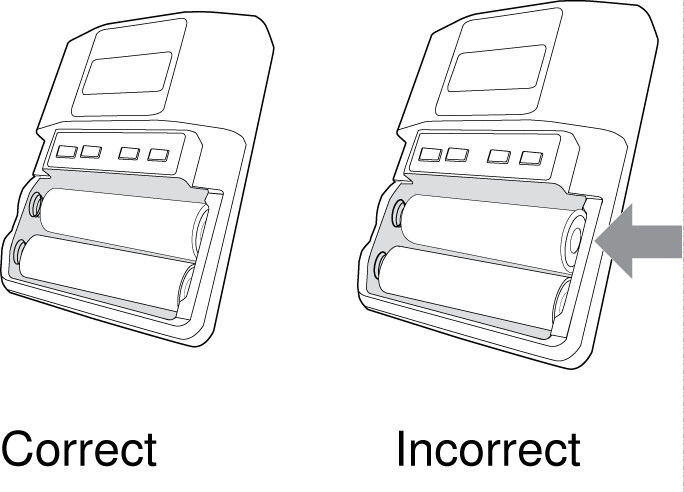 269 mm x 51 mm (10.6 in. x 2.0 in.) L x Dia. Note: Frequency bands might not be available for sale or authorized for use in all countries or regions. For the band Z17 (1492-1525 MHz), it must be used indoors only. For the Band Z19 (1785-1800MHz) used in Australia, per Radio Communications Low Interference Potential Devices Class License 2015; item 30 note C: the system must be operated within the range of 1790-1800MHz when used outdoors. The values in this table are typical of fresh, high quality batteries. Battery runtime varies depending on the manufacturer and age of the battery.